Champion Thread offers custom yarn constructions and packaging to meet the most demanding Industrial, Leno, Selvage, Braiding, Weaving, Circular Knitting, Warp Knitting, Wire/Cable and many other market applications. We also provide multi-component twisted and cabled spun and filament yarns, multiple end up winding, pencil tube and jumbo winding. Champion can engineer yarns to solve your most difficult processing challenges. 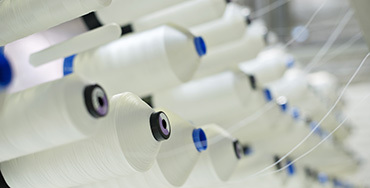 We have the dedicated experience and capabilities to create a wide range of engineered yarns used in a broad range of industries and markets, including specialty marker yarns, separator yarns, hose processing yarns, specialty weaving and batch seaming yarns. We produce specialty yarns used in processing of flexible medical products, automotive, aeronautical, and bicomponent yarns used in airbags and roofing products. Our specialty yarns can also be found in cable management and data centers for some of the world’s largest technology companies. Packaging options include everything from bulk cones for the manufacture of edge warp beams to precision wound cones and king spools for on board creels or peg stands. Our proprietary, precision lubrication application reduces fiber-to-metal friction while maintaining a yarn that will not attract fly. Optimum levels of fiber-to-fiber friction ensure high efficiencies by securing the pic and precision winding maintains consistent yarn delivery tension to the weaving machine. Our proprietary lubrication process reduces fiber-to-metal friction while maintaining the fiber-to-fiber friction needed to lock in pics on the fabric edge. Champion Thread’s industry experience and testing allows us to produce yarns with optimal twist, strength, and elongation that deliver ultra-high loom efficiencies. These yarns include flat yarns, twisted yarns, cabled yarns, FDY, HOY, spun yarns, bi-component, low melts, and more. Our state of the art technology and years of industry service allow us to produce packages with uniform tension, smooth yarn delivery, maximum yield and no dropped ends on multiple end up processing. As a cost-effective alternative to plastic cable ties, cabled or twisted polyester, waxed lacing cord (wax cable) is perfect for a wide range of indoor/outdoor telecom and electrical cable installations and other applications.